A fun, supportive, innovative learning environment. 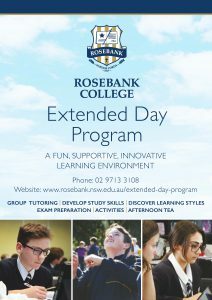 The Extended Day Program is an initiative of Rosebank College that operates after school five (5) days a week from the end of school to 6:00pm. The program offers a fun, interactive learning structure for all students from Year 7 to 12. The Extended Day Program helps the students develop positive study and revision habits, gain assistance completing assignments and meet new friends. Afternoon tea is provided, and after 5:00pm students have the opportunity to continue to study or socialise by partaking in sporting activities, games and creative arts. The program relieves the burden on parents and allows quality family time in the evening. Students have opportunities for academic assistance with study, assessments and homework for all subject areas. Along with academic help, students will be able to develop study and research skills, learn how to effectively manage their time and understand their preferred learning styles for exam preparation. The Study Group cost is $30 per afternoon with a discount for multiple afternoons per week. The cost is inclusive of 3:15pm to 6:00pm. Tutors facilitate the program in a supportive small group environment. These 45 minute sessions will be offered at a cost of $25 per session (if already participating in the Extended Day Program/ Individualised Tutoring on that day, the additional cost is only $10). To enrol, please go to the Extended Day Program Booking Website (https://bookedp1.timetap.com/). Individualised tutoring is a great opportunity for students to gain confidence in subjects they are struggling in and allows the tutors to tailor the program to individual learning needs. Individualised tutoring is offered in 45 minute time slots. The cost includes tutoring and afternoon tea. Students have the opportunity to join the Extended Day Program before and/ or after their tutoring time slot. 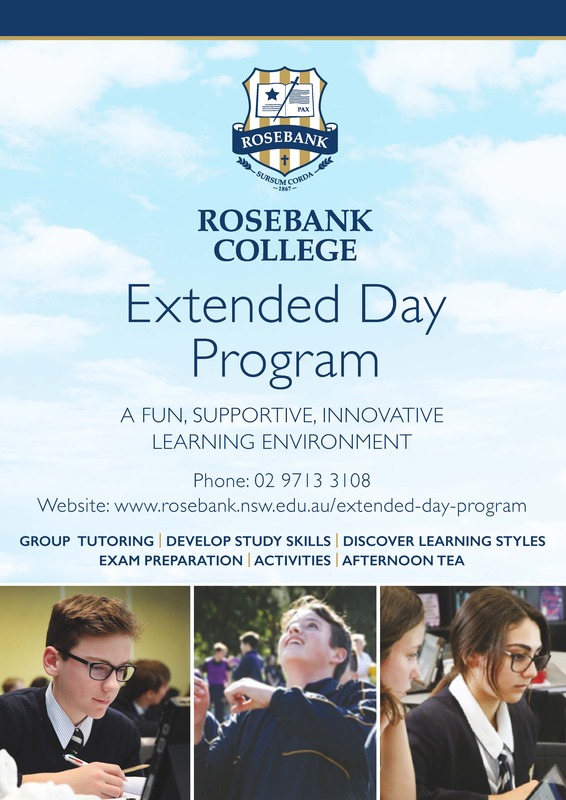 If you would like to enquire about Individualised Tutoring please contact the Extended Day Program Manager, Danielle Puhlmann at dpuhlmann@rosebank.nsw.edu.au or phone call on 9713 3108.